Allison Leigh Holt (b. 1972) is a cross-disciplinary artist based in Oakland, CA. Working at the intersection of sculpture, video, installation, and performance, she pursues a dialogue between divergent ways of experiencing, comprehending, and describing reality. Holt has received numerous awards from institutions including the U.S. Department of State (Fulbright Scholar, Indonesia), Djerassi Resident Artist Program, the San Francisco Arts Commission, the David Bermant Foundation, Cemeti Institute for Art + Society (Indonesia), the Experimental Television Center, and Bullseye Glass Co. She was a recent resident researcher at the Harvard-Smithsonian Center for Astrophysics, and a resident artist at the Santa Barbara Center for Art, Science + Technology (2018). At the 2016 University of North Dakota Writers Conference, she was a keynote speaker in conversation with science fiction author Kim Stanley Robinson and theoretical physicist Brian Greene. Holt has exhibited, screened, and performed her work at SFMOMA, Stanford University, Anthology Film Archives (NYC), Cemeti Institute for Art + Society (solo, Indonesia), The North Dakota Museum of Art (solo), the Boston Cyberarts Festival, San Francisco Cinematheque, Axiom Gallery for New and Experimental Media (solo, Boston), the Urban Screens Conference (Melbourne), and the Yogyakarta International New Media Festival. 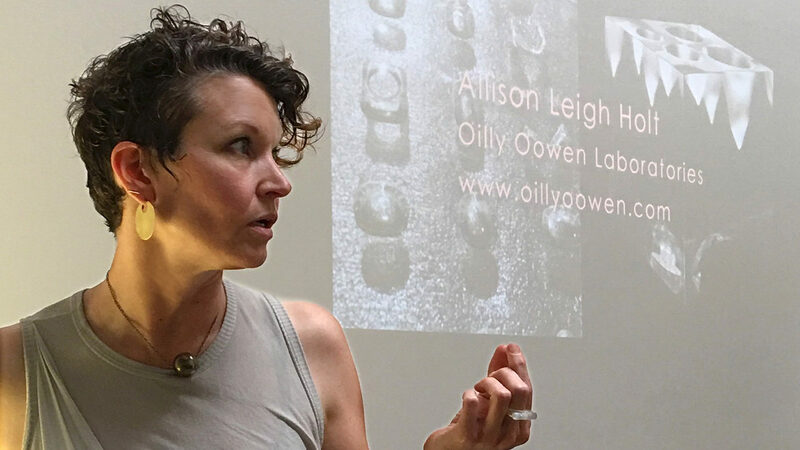 She has presented at cellsBUTTON(s) and Video Vortex conferences in Indonesia, the Cultural Studies Association Conference, the 20th Annual Science of Consciousness Conference, and Imagining the Universe: Cosmology in Art and Science at Stanford Arts Institute. Holt studied at The Evergreen State College (BA) and Massachusetts College of Art (MFA). Over the past few years, I have created research–based projects that explore divergent ways of perceiving, comprehending, and interacting with our world. These projects use diagrams, videosculpture, sound, light, and performance in attempts to illustrate the frameworks embedded in consciousness. By developing relationships of trust over time—with Javanese shamans, autistic individuals, and astrophysicists—I am able to interpret the core structures I find within sometimes endangered worldviews into diagrams. These become prints and/or blueprints for works in glass, plexiglass, or resin. When activated by video, the latter reveal delicate, powerful moving images, resulting in three-dimensional forms that convey higher-dimensional phenomena, or alternate concepts of time. I am interested in the interrelatedness of human knowledge, natural systems, and spirituality that is endemic to sophisticated ways of orienting oneself in reality. My work describes perspectives that propose radical shifts in cultural, anthropocentric, and Earth-based biases, at a time when human behavior determines our planet’s survival.